Sometimes, you just need a little fresh air. A gasp of ice on a sub-zero night. A whiff of sunshine and hot concrete. The smell of fallen leaves and crisp bonfires. 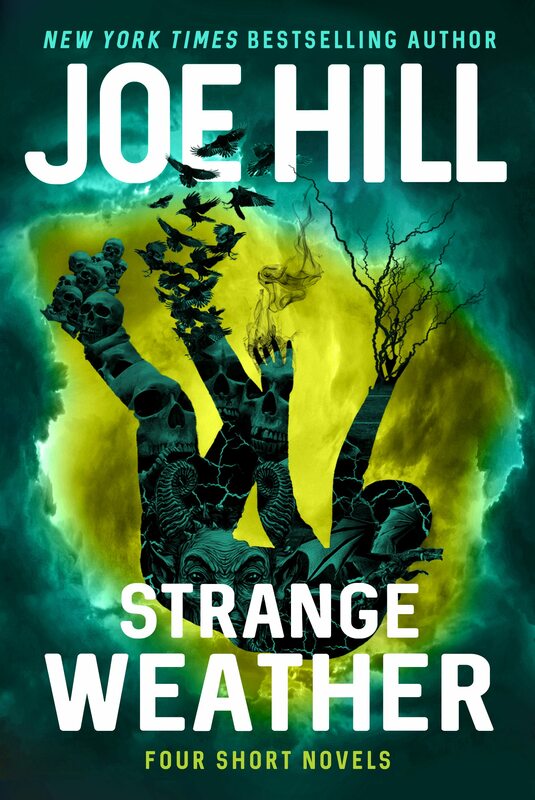 Each inhalation reminds you of the season, so with the new book “Strange Weather” by Joe Hill, breathe deep. Michael Figlione had known Mrs. Beukes for most of his life. She’d always lived just down the block and was his family’s housekeeper once but by that summer of ‘88, those days were over. By then, she could only wander the neighborhood, addled and half-dressed, mumbling about a man with a Polaroid camera. Thirteen-year-old Michael figured – as did every adult on the block – that she’d become some crazy old lady but, in “Snapshot,” the truth was nothing to say “cheese” about. In “Loaded,” Randall Kellaway said he didn’t do it. He never put a gun to his six-year-old son’s head, never threatened his wife, but that accusation was the latest of a long string that began when he was kicked out of the Armed Forces in disgrace. Now he wasn’t even allowed to own guns and he certainly wasn’t allowed to have one at his Mall Security job; still, it was a good thing he was armed when a love-affair-gone-wrong turned into a bloodbath at the mall’s jewelry store. Rand had shut the situation down and everyone was calling him a hero – everybody, except that female reporter from the local newspaper, who’d been digging a little too much into Rand ’s past. She’d pay for that. She’d burn for it. Aubrey loved Harriet. Though it wasn’t reciprocated, he loved her enough to parachute from a plane in honor of her best friend, who’d died. He didn’t love parachuting above the clouds, though, but he jumped anyhow and in “Aloft,” he fell…. and landed on something frighteningly solid. I need a new easy chair. I read “Strange Weather” and ruined the old one by repeatedly hanging on to the edge of my seat. That’s when I wasn’t clenching my teeth, grimacing or gasping, or forgetting that what author Joe Hill has written about is not real. Or is it? Hill has a way of turning words to make them glitter, and casually speaking to readers to convince us that the world he presents entirely, physically exists. There’s actually a man with a camera. People are walking around on clouds right now. And guns…? Entirely plausible, considering current events, which only makes that story, and its three individual companion tales, psychologically tighter, OMG surprising, and hard to shake for hours after you’ve finished them. Yes, these stories are creepy, but not too Out There. They’re tense, and absolutely scream-worthy. “Strange Weather” will leave you with an atmospheric chill but sometimes, you just need a little fresh scare.